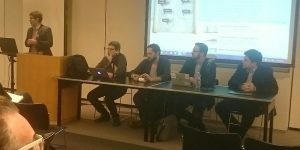 This Monday, February 6, The Graduate Center hosted one of New York City’s largest digital humanities events of the year: NYCDH Week! Kicking off a week of 37 workshops across New York City, the day included presentations from graduate student prize winners, a roundtable discussing DH infrastructure, and a keynote address from the Dr. Stephen Brier, who won the inaugural NYCDH Award for his contributions to the digital humanities community. From the start of the day, we had a large crowd with lots of faces coming and going, and a core group who stayed the duration. 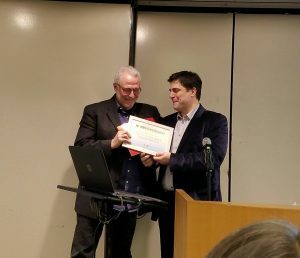 Co-fellow Javier Otero Peña and I were tweeting the proceedings from @cunygcdi and @Digital_Fellows, for folks who couldn’t make it to the event, and below I describe the whirlwind of remarkable presentations. Monica McCormick, NYU Program Officer for Digital Scholarly Publishing, opened the morning introducing NYCDH from its founding myth of scholars at a conference under a tree in California through its fledgling Commons in a Box startup and to its current vibrancy. She lauded the remarkable collaboration represented, the caliber and quantity of projects applying for grants, and the impressive work of prize winners. Monica thanked Lisa Rhody, Deputy Director of CUNY GCDI, for organizing space for the kickoff, as well as NYCDH members Kimon Keramidas, Stephen Klein, Jesse Merandy, Elizabeth Cornell, Alex Gil, Andie Silva, and the NYCDH steering committee. She then turned the stage to Zach Coble to introduce the graduate student prize winners. What an astonishing range of projects! After Monica’s introduction, the prize winners each presented their work. Second place (tie) Lisa Tagliaferri, a PhD candidate in the Graduate Center Comparative Literature program, opened with “Lyrical Mysticism: The Writing and Reception of Catherine of Siena,” displaying her network analyses of the correspondence of Catherine of Siena. In addition to her myriad D3 visualizations, Lisa enriched her presentation with biographical details of her research. I was particularly glad to know that, for at least one correspondent, Caterina caught his head at his beheading. She has shared her slides on the HASTAC website. Second place (tie) After Lisa, Hannah Aizenman, Graduate Center Computer Science PhD and Digital Fellow, presented Futures Past Archive, the project she works on with Patrick Smyth (GC English PhD) and Jill Belli (Assistant Professor of English at CityTech). With energy and enthusiasm, Hannah described the curious predicament of time in speculative, especially science, fiction. When authors imagined futures, whether utopic or dystopic, how far did they cast their imaginations? How far in advance did they predict technologies? Hannah, Patrick, and Jill have been working with public domain texts to determine the future delta, which is the time between when a book was published and when it is set. Hannah presented the problem of the vague or multiple futures often staged in speculative fictions. “Think of the last speculative fiction you read — when was it set?” Though Kimon Keramidas ruefully answered “1984,” the audience contemplated the fuzzy “not-too-distant” futures of speculative fiction. Hannah also brought up NY City Tech teammate Jill’s outreach and student engagement through course-centered tagging of science fiction. Honorable mention Rachel Daniell of the Graduate Center Anthropology program then presented “Digital Afterlives of Government Documents,” her project-in-process that looks at War-on-Terror era and the archivists role in registering events for public historical consumption. She compared a series of databases and conducted interviews with archivists and indexers. Her take-away, “the power of meta-data,” which she dubbed “possibly Pollyanna-ish,” was met with definite agreement from everyone in the room whether librarian or library dependent (isn’t every grad student?). Rachel outlined the challenges of working with the ACLU’s Torture Database API and gave hearty thanks to the CUNY New Media Lab for helping her develop her Drupal database and feeds. Honorable Mention Burçak Özludil Altin, PhD candidate in joint Urban Systems Program at Rutgers and NJIT, presented “Life of an Insane Asylum: A Temporospatial Simulation.” Burçak and her team, Augustus Wendell (NJ Institute of Technology) and Ulysses Thompson (NJ Institute of Technology), have been working to build a historical model of an Ottoman asylum using Unity3D, software typically used in game design. The team is also working on building tools for historical modeling (SpatioScholar). The project presents a novel angle on Ottomon Modernization, as well as history of psychiatry in non-Western context. Honorable Mention Mary Catherine Kinniburgh, Graduate Center English PhD and Digital Fellow, presented “Digital Alchemy,” her work which explores the rise in makerspaces as a reclamation of process-based crafts culture of medieval alchemy. Mary Catherine narrated the undulations of the occult and mainstream in these movements. She measured the tradition of these practices in relation to rapid technological velocity. She added dashes of wonder and specters from sacred texts of Donna Haraway, N. Katherine Hayles, and Wendy H. K. Chun. First Place William Fenton rounded out the morning talks, humbly crediting all the prize winners and honorable mentions, and describing his wide-reaching primary-source archive and critical edition Digital Paxton. William gave background into the Lancaster Massacre of Native Americans and its subsequent pamphlet war for those of us unfamiliar with the crisis and its print proliferation. After some “Birds-of-a-feather” lunches led by NYCDH veterans, we returned to a series of lightning talks given by community members. It was definitely electrifying. Erin McCabe presented her work on government transparency following the loss of Sunlight Labs. Evan Koblentz from The Vintage Computer Federation spoke about the rise of worldwide science illiteracy. STEM is good, but not enough, he said. We need history of scientific thought. His organization seeks to provide resources to those needing access to obsolete systems. Unfortunately, I didn’t catch his name. If anyone reading this post has information, I would be grateful for the revision. Angus Grieve-Smith, language and technology consultant and NYCDH constant, described his work on the future of distributed annotation, plans to develop version control, and richer work around a system like hypothes.is. Fordham librarian Tierney Gleason presented on 19th Century Feminist Data, describing how she has been working through documents of the House of the Good Shepherd in Manhattan to discover the way women’s unwanted activities led to institutionalization and incarceration. She seeks collaborators and cited the abundance of open data available in historic registers. David Schwittek, professor at Lehman College, presented his project on the myths and realities of Mexican immigrant health. He noted how disciplinary constraints (he’s in the art department) shape the concerns of his work. Pace University Associate Professor of English Kelley Kreitz introduced babblelab.org which aims to consider the incorporation of digital pedagogy from kindergarten onward. Fordham English PhD candidate Alisa K. Beer, whose tweets on #NYCDHWeek17 deserve special mention, presented her work on medieval manuscript encoding. After attending a workshop on TEI at Yale, Alisa has generated her own digital manuscripts workshop which she will lead at Columbia this March 25-27. Zach Coble rounded out the talks describing the efforts of Jennifer Vinopal and Monica McCormick on NYU hosting. He mentioned the work and philosophy of Reclaim Hosting, praising their efforts to support scholarship. To close the lightning talk, we heard from the #digitalgc. 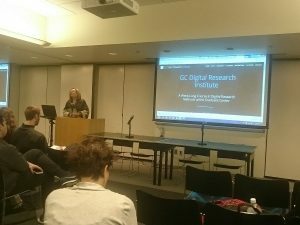 Hannah Aizenman returned to present the many digital efforts built by CUNY GCDI and the Digital Fellows. She did us proud. Lisa M. Rhody followed up with encouragement to follow the GC Digital Research Institute model (fork it! customize it! build your own!) for generating skills across disciplines. Claire Potter opened by comparing resources (human and material) she has found as director of a digital humanities center at the New School with those she found at her previous position at Wesleyan College. 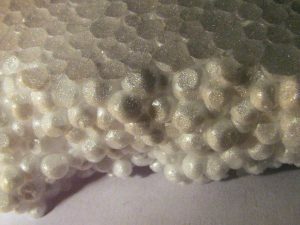 In her efforts to develop Digital Across the Curriculum (along the lines of Writing Across the Curriculum), she looks at distributed curricula, space constraints, and graduate student labor. Claire also made a great argument for teaching resilience. She described the way she pieced together a center by repurposing what she could find, and advocated gathering resources across departments. Ben Vershbow gave insight into the catalytic structures that enabled rapid provisioning at NYPL Labs. 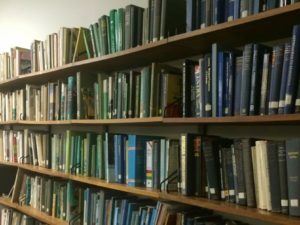 He noted that infrastructures of Flickr Commons and Heroku made possible the crowdsourced layers and public scholarship he pursued at the Institute for the Future of the Book and the New York Public Library. Launching core services on a cloud model instigated certain infrastructural shifts that the NYPL continues to negotiate. Matt Gold recalled the NYPL Labs inspirational sense of play. 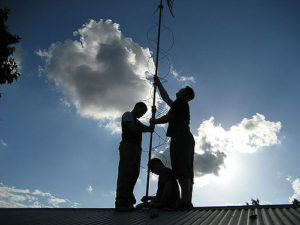 For Matt, DH infrastructure depends on communication, as evidenced across his projects. He said that people are central — a community is necessary to use any resources gathered. To this end, he listed support for students as crucial, which he works for in programs like Provosts’ Digital Innovation Grants and GCDI Digital Fellowships. Contrary to some of Ben’s tactics, Matt talked about the importance of facing the challenge of collaborating with IT to find mutually beneficial setups for experimentation. Conditions for success, he argued, are local, even as we face common concerns. DH infrastructure should meet the needs and personality of each institution. Kimon Keramidas described his participation at nascent DH programs at CUNY (he was in the second ITP certificate cohort), the Bard Graduate Center, and now The Draper Program at NYU. Across all his institutions, he described the significance of finding hard-working, trustworthy collaborators. Inaugural NYCDH Award winner, Steve Brier was introduced warmly by Ellen Noonan, who remembered how her first impression of Steve was that she wanted to be him when she grew up. 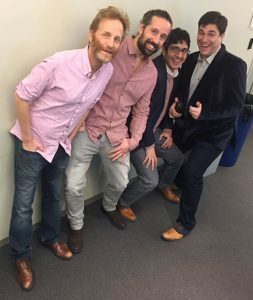 Equally fond remarks were given by Matt Gold, who has worked with Steve as a co-teacher, co-proposer of projects and programs, and fellow GC traveler. Matt commented on Steve’s role as a booster and builder. Kimon Keramidas referred to Steve’s irrepressible integrity in midst of bureaucracy. Steve accepted with genuine gratitude for an unexpected honor. Steve’s keynote “Confessions of a Premature Digital Humanist” traced a storied history of a scholar, teacher, and mentor. Coming from his background in labor history, public history, documentary film, CD Rom text books, and through the American Social History Project, the Interactive Technology and Pedagogy Certificate, and the Journal of Interactive Technology and Pedagogy, Steve described the sources of his work and impulses of his unrelenting efforts to develop new work in new forms. His conclusion was met with heartfelt ovation for a career of contribution and commitment. I sadly did not make it to the celebrations at Digibar, but I hope to make it before to long! Certainly after the rest of this amazing week. 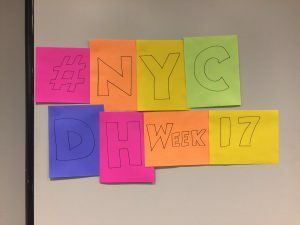 I encourage everyone to register for the free city-wide workshops at the NYCDH Week website.